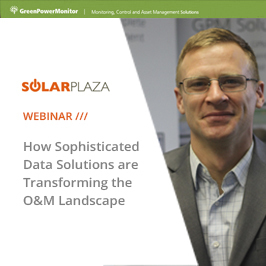 Peter Kobliska, Director Business Development of GreenPowerMonitor and Ben Hansen, Senior Manager for Global O&M Service Solutions at SMA will join the webinar “How Sophisticated Data Solutions are Transforming the O&M Landscape“. The aim of the webinar is to discuss how effective data gathering, organization and presentation are enabling a more efficient O&M strategy. How optimizing a plant’s maintenance schedule utilizing predictive data analytics can have a profound impact on profitability. What sophisticated new data gathering and analysis solutions are used to determine if/when equipment may need to be repowered. How monitoring solutions are enabling O&M providers a greater level of accessibility and analyzation to create effective action plans. Save the date! 27 February 2018 - 09:00am PST – 12:00pm EST – 6:00pm CET. If you want to learn more please register for the webinar and join us!